How to Choose the Best Accessories for Your Face Shape - Cherry Colors - Cosmetics Heaven! Accessories like hats, jewelry, sunglasses, and scarves are all fun and inspirational ways to accentuate your best features. These accessories are great for complimenting your favorite look—making you feel pulled together and fabulous! However, did you know that choosing the best accessories often starts with understanding your face’s shape? The following are some of the most common face shapes, along with our best tips on how to choose the most impressive accessories to fit your unique visage. An oval face shape is a very common type. This facial structure is well balanced and is neither too long nor too wide. It is slightly wider in the cheek area, which does not take away from its naturally soft appearance. This makes it an ideal shape for many types of accessories. Oval face shapes are quite easy to style because all types of accessories can make it more flattering. From long necklaces or chokers that accentuate the neckline to dainty round diamond earrings that bring attention to the soft roundness of this shape - the options are almost endless. As one of the stronger face shapes, a square-shaped face is symmetrical and boxier in appearance. This face shape features a strong jawline along with an equally pronounced forehead and hairline area. When it comes to accessorizing this face shape, choose round pieces that will deflect the sharper edges of this structure. For instance, choose large round sunglasses or rounded earrings like circular studs and hoops for the best results. Such accessories will help to create the necessary contrast that softens such well-defined features. Similarly, when it comes to round face shapes, there are some accessories that are better suited than others. Round face shapes are circular in appearance and are completely symmetrical from top to bottom and from side to side. Both the jawline and brow area are gently rounded throughout. The best accessories for this face shape include square-shaped jewelry, longer rectangle shapes, dangling necklaces and pear-shaped earrings—especially shapes with distinct lines and edges. Do keep in mind that you should avoid long horizontal lines that can make the face appear wider than normal. Diamond face shapes are identified by a narrower forehead, wider cheekbones, and a narrow chin. To best highlight, the features for this face type, try accessories that draw more attention upwards to the eyes and forehead or downward to the chin area. This will help fill in these narrower areas and give the illusion of fullness. For the best results try earrings that are tear, pear or chandelier-shaped, shorter or medium length necklaces and rounded necklines which can all complement pointier chins and forehead areas. Another common face shape is the oblong face, which is similar to the oval face shape. However, the main difference between the two is that oblong faces are much lengthier in comparison. Additionally, this facial structure is slimmer from top to bottom. For oblong face shapes, invest in pieces that give the illusion of more width and fullness to make your face look more proportionate. It will be important to stay away from vertical lines and instead, choose horizontal accessories like wide sunglasses and shorter statement necklaces that draw attention away from the length of your face. Heart shaped faces are charming with a wider brow area that tapers down to a sharp chin. Therefore, choose accessories that draw more attention to the bottom portion of the face. This will create more fullness and proportion in this area. Try wider earrings in diamond-shaped or triangle motifs in addition to wide statement necklaces that draw attention towards the neckline for the best results. In conclusion, your face is often the first thing that people see and the wrong accessories can throw off your entire look. 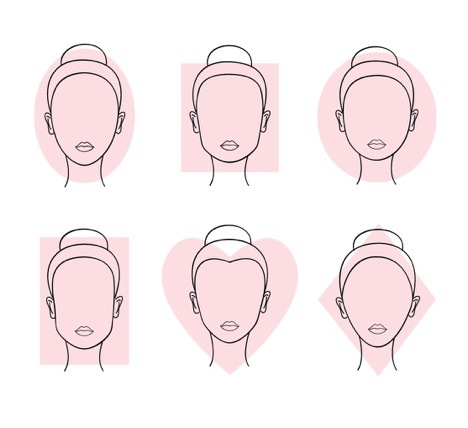 By understanding your face’s shape you can always look your very best. Having this insight will help you choose the best accessories that highlight your appearance and make you feel good about yourself. Try any of these helpful fashion tips today and choose the most flattering accessories for your face shape today.